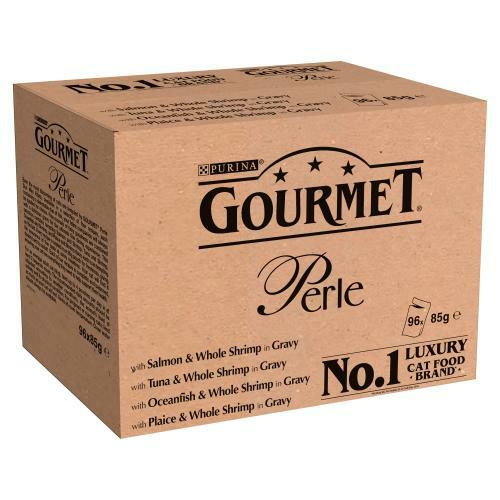 Even the most discerning of cats are tempted by Gourmet® Perle Duo Mini Fillets. Available in a selection of four recipes, each containing a delectable duo of fish, your feline companion will always be spoiled for choice. Fine morsels of fishy goodness are combined with a delicious gravy for the ultimate fine dining experience. This selection contains tempting Salmon and Shrimp, Tuna and Shrimp, Oceanfish and Shrimp, and Plaice and Shrimp duos; each is as tempting as the last. Every recipe is sealed in an 85g pouch for freshness, giving the assurance of fine taste at every mealtime. Your cat will find it doubly hard to resist! Each of our recipes is complete and balanced, ensuring your cat has everything they need to help support their health. For an average adult cat (4kg), feed up to 4 pouches per day in at least 2 separate meals. The recommended daily amounts should be adjusted according to weather conditions, the animal's level of activity and its physical condition. For pregnant or nursing cats; feed as much as your cat will eat. Serve at room temperature. Clean water should always be available.